The U.S. Navy successfully fired a Rolling Airframe Missile (RAM) from a SeaRAM launcher aboard the Independence-class littoral combat ship USS Coronado (LCS 4) for the first time Aug. 14, according to a Raytheon Company news release. The missile was launched during a live-fire exercise on the Naval Air Warfare Center Weapon Division’s sea range off the coast of California. Coronado fired the RAM from its SeaRAM anti-ship missile defense system. The SeaRAM detected, tracked, and engaged an inbound threat target, and successfully intercepted it with a RAM Block 1A missile. Both RAM and the SeaRAM system are produced by Raytheon. The SeaRAM system employs the Phalanx Block 1B’s high-resolution search-and-track sensor and computer systems and reliable quick-response capability, but replaces the Phalanx’s 20mm Gatling gun with an 11-cell RAM launcher. SeaRAM leverages the proven Phalanx Close-In Weapons System (CIWS) that is fitted to many U.S. Navy, allied, and partner nation ships worldwide. The SeaRAM system employs the Phalanx Block 1B’s high-resolution search-and-track sensor and computer systems and reliable quick-response capability, but replaces the Phalanx’s 20mm Gatling gun with an 11-cell RAM launcher. RAM’s superior accuracy, extended range and high maneuverability extend the reach of the system while enhancing its accuracy and effectiveness against 21st century targets., including fixed-wing and rotary-wing aircraft, anti-ship missiles, and other threats. The above-deck SeaRam system fits the exact footprint of the Phalanx, uses the same power, and requires minimal shipboard modification, and is seen as an affordable capability upgrade for those ships employing the Phalanx system today, according to Raytheon. It currently is mounted on all Independence-class littoral combat ships. 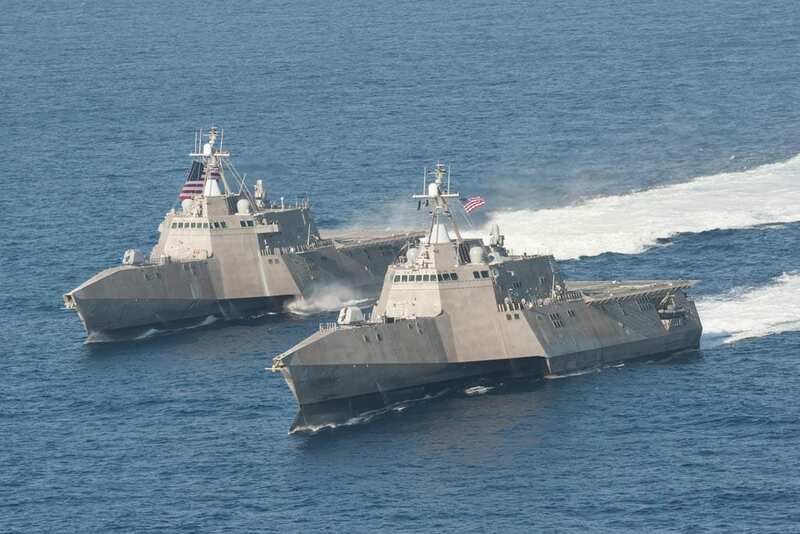 The Freedom-class littoral combat ships currently employ the RAM launcher but are expected to upgrade to SeaRAM during planned refits to enhance the lethality and survivability of the class.